In 12-inch nonstick skillet, heat 2 teaspoons of the oil over medium-high heat. Add onion; cook 5 minutes, stirring occasionally, until onion begins to brown. Remove from skillet; set aside. Season both sides of pork chops with 1/4 teaspoon of the seasoned salt, the thyme and pepper. Heat remaining 3 teaspoons oil in same skillet over medium heat. Add pork; cook 2 to 3 minutes on each side or until browned. Transfer from skillet to plate. Add water, vinegar, quinoa, parsley, cooked onion and remaining 1/2 teaspoon seasoned salt to skillet. Heat to boiling. Reduce heat; place pork and any juices on top of quinoa mixture. Cover; simmer 10 minutes. Add broccoli and peaches; cover and cook about 10 minutes longer or until quinoa is tender and meat thermometer inserted in center of pork reads 145°F. 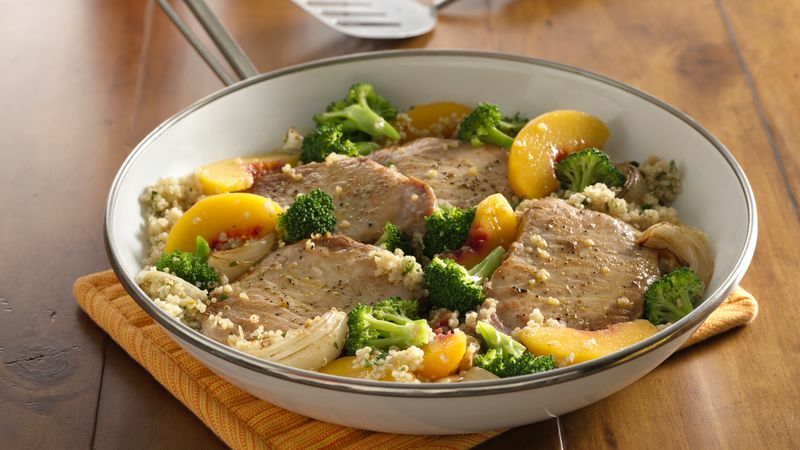 Omit the seasoned pork chops and this quinoa skillet dish would make a great side dish to pair with other plain meats such as roasted chicken or pot roast.